Loved it really gripping book kept me reading and a twisty ending that made me think. 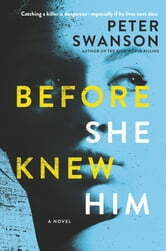 "Before She Knew Him" is a well-constructed novel of mystery and suspense. Mira and Matthew and Henrietta (called Hen) and Lloyd, both childless, are next door neighbours in a Boston suburb. Hen becomes suspicious of Matthew, believing he has committed a murder. She has a history of manic depression, however, so her suspicions of Matthew are not totally believable. As the story progresses other murders occur, and Hen becomes more convinced that Matthew is at fault. This book held my interest from beginning to end. Readers will likely be surprised at the twist towards the end. A very good read. I know that, once again, I’m in the minority here but I do not recommend this book. It was very disappointing. It started so well. It was quite promising. Unfortunately this book did not work for me. The writing is not that bad and kept me engaged. The storyline is just okay and it was well constructed, but not very original and not well developed. The characters are flat. This is just another book with characters with some mental health issues and characters with abusive parents that justify their actions. Just a Few Words: A rather dark thriller filled with enough suspense and twists, that you don’t want it to end. I loved it! Okay, let's begin... Before She Knew Him by Peter Swanson is a psychological thriller First, let me thank Edelweiss, the publisher Harper Collins, and of course the author, for providing me with a copy of this book in exchange for an honest review. All opinions are my own. My Synopsis: Hen is bi-polar. Her first manic episode occurred in college, when she was sure a student was trying to kill her. She attacked that student. Her second episode occurred when Dustin Miller, who lived down the street, was murdered. Hen obsessed about him for a long time. But they changed her meds, and although she thinks she’s a tad less creative in her artwork, things have been good for years. Lloyd is Hen’s husband, and has been with her through the good and the bad. He loves her, but he watches her like a hawk, always wondering when the shoe is going to drop again. Matthew and his brother Richard grew up in a horrible home. Their father treated their mother like a second-class citizen, abused her and cheated on her. Eventually she became just what he said she was. Matthew seldom talks about his childhood. He fears Richard has become like his father. Hen and Lloyd move out of the city, into a small community. Hen is an illustrator, and the near-by studio is perfect. Their new neighbors Mira and Matthew seem nice. Until that is, Hen spots a fencing trophy just like the one that went missing from Dustin Miller’s place. Hen is convinced Matthew is a killer…and he knows she knows. My Opinions: This is the first book I have read by Peter Swanson. It won’t be the last. I have now moved The Kind Worth Killing closer to the top of my reading pile. Hmmm. Okay, concentrate...back to Before She Knew Him. This book peaked my interest at the beginning, and then picked up speed. When I hit the half-way mark I didn’t want to put it down….and that continued to the end. Needless to say it was a fast read. Swanson created great characters, with enough depth that they felt real, and although some of the events were predictable, others were not. As well, with the story being told from different perspectives, the reader saw and understood so much more. Of course with an unreliable narrator or two, belief was thrown out the window. I liked the writing style, and loved the plot. The author dealt with mental illness in a thought-provoking way….and how many of us would agree to sit down with someone we knew was a killer - well, okay, a few of us might. I loved the relationship between Hen and Matthew. I just loved this book!